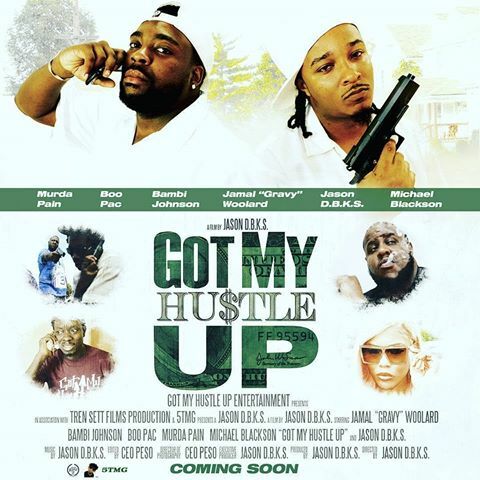 Local filmmaker Jason Hampton will hold a screening of his film Got My Hustle Up tonight at the Danbarry Dayton South at 7pm. Tickets are available at the theater. The film actually premiered on October 31st at the Victoria Theater and has also been shown at The Neon. Jason made this movie on a very limited budget and a big dream with the determination to make a movie in his home town. The film is about a young man forced to grow up quickly after his father is killed. Growing up fast in Dayton, OH his surrounded by violence and the drug life. He wants to be a good father to his son but struggles to support him on his salary as a pest control technician. Jason and his partner Boo Pac find themselves in dealing with crazy customers and a crooked boss. Eventually he’s face to face with the man responsible for his father’s death. Jason wonders if the gaining money, power and respect are worth more than loyalty to his father. The movie was all filmed here in Dayton and features Micheal Blackson, a comedian and actor who appeared in the 2000 comedy film Next Friday and was seen on 30 Rock. Also appearing, Jamal “Gravy” Woolard actor, rapper, and comedian best known for portraying musician The Notorious B.I.G. in the film Notorious, and, as a supporting character, in the Tupac Shakur biopic All Eyez On Me. Jamal “Gravy” Woolard is an American actor, rapper, and comedian. He is best known for portraying musician The Notorious B.I.G. in the film Notorious, and, as a supporting character, in the Tupac Shakur biopic All Eyez On Me. The film is rated R.